I wish I had a ‘before’ photo of our old dining table. 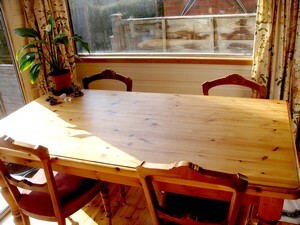 You might remember me talking about our dining table before; we managed to get a large pine table from Freecycle. The lady told me the legs had been nibbled by her dog, but to be honest, it added to the charm of the furniture. With three cats and a dog ourselves at that time, it was simply a fun part of the history of our home. What we hadn’t accounted for, however, was a really weird feeling to the top of the table. Imagine if you will walking into a primary school dining hall. It’s a Friday afternoon and the same tables have been up for those children all week; only the dinner ladies have been off and no one has cleaned those tables for a week. I want you to go and sit down, roll up your sleeves and put your arms onto that table. Gross right? Your arms are no doubt sticky and you feel like you need a shower when you get home. Well, if you can imagine the table sans bit of spat out potato and sweetcorn (although that does happen on occasions) you’ve basically got the feel of the table we had. We scrubbed that table with every cleaning product we could think of and still it had a sticky top. I used wire scourers, wire wool, but nothing would shift that sticky feeling. It was like an artist’s paste up table. And honestly, if you read the newspaper at it, you’d leave the front page behind whenever you put the paper away. Yes, the front page would stick right down onto the table and rip when you tried to put it away. Now I knew that table was biologically clean, but frankly it got embarrassing. I was fed up of explaining to people that even though the table felt like it hadn’t been cleaned for a year, it was in fact clean. We all know that our own dirt is far more palatable than someone else’s. No word of a lie, I was getting to the stage where I would rather eat off the floor than the table. So what to do? Technically the table was ok; nice solid wood, the perfect size for our space, but really starting to bug me with its stickiness. Even Little Miss Green was starting to complain, and she’ll still happily put her butter stained hands through her hair and across her face without washing afterwards. It seems sacrilege to get rid of it just because of its sticky top. On the next sunny day, Mr Green took the table outside and sanded it down. He spent all morning taking off the top sticky whatever-it-was and then we put a couple of coats of Linseed Oil on it. I’m telling you, that table is transformed. It looks like new and, it’s several shades lighter than it was before. This sticky whatever-it-was must have been absorbing dirt, grease and dust for all these years and I was astonished to see how pale the table was. In fact it looks perfect with our floorboards now and is more of a match than it ever was. So there you go. My table hasn’t ended up being given away or dumped in the landfill; it just took a morning or work and a couple of coats of oil to restore it and I feel like I’ve got a new dining table. What about you – have you ever salvaged any furniture rather than getting rid of it? I’d love to hear your story! Very smart solution to your problem and the table looks beautiful! Um, practically everything we own! Our best find was a dresser bottom and china cabinet on top that we got at a Banardo’s furniture shop for £95. The top of the bottom piece is scratched, but you can’t see it when it’s put together and a corner of a bit of trim was missing in the top piece. I rubbed that over with a dark brown wax crayon and it’s completely unnoticeable now. The varnished finish had been applied incorrectly, that’s why it was sticky. Perhaps someone had previously tried to refinish the top. There’s nothing to be done but just what you did! I have a kitchen set that seems hard to keep clean because someone took the sealing coat off the paint of the chairs by scrubbing them, probably with Vim! I seem to be constantly washing them down to get rid of finger marks and such, and I know it’s not because we are especially dirty, but because the finish was ruined. Eventually I will repaint the chairs, but sanding chairs is such a boring job. The set came from the church rummage sale, and was exactly the style I’d been looking for. @Alea: Thanks Alea; great to see you popping by – hope all is well in your world. @Magdalena: Ah yes, sanding down. Mr G made that more enjoyable by taking the table outdoors and doing the task in the sunshine. Thanks for the verdict on the tabletop – I never knew things could be so disastrous!